SUMMARY: We report a rare case of schwannoma of the sinonasal cavity, presenting with epistaxis and anosmia. A 27-year-old woman presented with an 8-month history of nasal obstructive symptoms and snoring. She also had bilateral epistaxis and anosmia. The remainder of her medical history was unremarkable. She was referred to an otolaryngologist whose clinical examination revealed the presence of polypoid nasal masses. A presumptive diagnosis of nasal polyposis was made. An endoscopic nasal polypectomy was performed, and pathologic assessment revealed findings consistent with a neurogenic tumor. The patient was then referred to a head and neck oncology center for further assessment. Cross-sectional imaging with CT and MR imaging was performed to restage the disease. CT imaging revealed evidence of previous left uncinectomy. A large expansile soft-tissue mass was noted anterosuperiorly in the nasal cavity, which extended up to the cribriform plate with evidence of bony dehiscence (Fig 1A–C). There was patchy enhancement after iodinated contrast administration. Remodeling of the medial orbital walls was also noted. A, Axial contrast-enhanced CT image shows an expansile mildly enhancing soft-tissue mass in the anterosuperior nasal cavity. B, Coronal CT image shows the mass causing mild remodeling of the medial orbital walls and extension up to the level of the cribriform plate. C, Coronal bone algorithm image shows dehiscence of the bony cribriform plate. MR imaging was performed to better assess intracranial extension and showed the mass lesion to be of intermediate T1-weighted and heterogeneous increased T2-weighted signal intensity (Fig 2). There was prominent enhancement after gadolinium administration. MR imaging confirmed a breach of the cribriform plate, but no convincing dural enhancement or thickening was noted. There was no brain edema. The patient underwent excision of the lesion via a transcranial approach. Recovery was uneventful, and the patient currently experiences occasional biorbital morning swelling. The symptom of anosmia resolved postoperatively. A, Coronal T1-weighted postcontrast image (TR/TE, 450/20 ms) shows an enhancing mass that extends up to the nasal vault. No definite dural enhancement is identified. B, Two serial sagittal and parasagittal T1-weighted postcontrast images (TR/TE, 666.7/20) help to further confirm the presence of cribriform plate dehiscence but a lack of gross dural disease. On histology, the tumor was seen to have low cellularity and showed tumor cells with oval nuclei arranged in an irregular manner (Fig 3A) constituting the Antoni A pattern seen in schwannomas. Loose, reticular Antoni B areas were less commonly encountered. Tumor cells were immunoreactive with S-100 antibody (Fig 3B). No atypical features were noted. A, Photomicrograph shows the tumor specimen to be of low cellularity and the presence of cells with oval nuclei arranged in an irregular manner. These are areas consistent with the Antoni A tissue pattern characteristic of schwannoma (hematoxylin and eosin/saffranin, original magnification, ×300). B, Diffuse reactivity for S-100 protein antibody is present in the specimen. This protein is found in high concentrations within Schwann cells (S-100 stain, ×300). The most common sinonasal neoplasms are epithelial in nature. Common examples include benign lesions such as polyps and malignant carcinomas. Schwannomas are lesions that arise from the neural sheath of peripheral nerves. The most common schwannoma in the head and neck is the acoustic neuroma arising from the eighth cranial nerve. Sinonasal schwannomas are uncommon lesions and represent <4% of head and neck schwannomas.1, 2 They most commonly arise as an isolated lesion and give rise to nonspecific symptoms such as nasal obstruction, epistaxis, and anosmia. Rare cases of intracranial3 and intraorbital extension have been described. Such extension of disease can lead to symptoms of rhinorrhea, a decreased level of consciousness, and strabismus. Extension into the sphenoid sinus can lead to diplopia and retro-orbital pain. Maxillary sinus involvement more commonly results in pain. There is no sexual predilection and the affected age range can vary from childhood to the very elderly.1, 4, 5 Imaging features are generally nonspecific. There is usually mild enhancement on contrast CT. Bone remodeling may be appreciated. MR imaging shows intermediate T1 and variable T2 signal intensity. The clinical and imaging differential diagnosis for a sinonasal mass would include squamous carcinoma, adenocarcinoma, lymphoma, esthesioneuroblastoma, meningioma, as well as an aggressive fungal infection. All of these lesions have been noted to affect the sinonasal cavity and can develop intracranial extension through the cribriform plate. In this patient, the lesion caused dehiscence of the cribriform plate but did not show gross dural invasion at the time of surgical resection. Although the imaging features for these lesions can overlap, there are some imaging clues that may be used to try to further differentiate them. For example, the presence of peripheral cystic change has also been described by Som et al6 as being suggestive of esthesioneuroblastoma. The development of intralesional hemorrhage has been described with adenocarcinoma7 and fungal infections. Fungal infections and meningiomas may also show the presence of internal calcifications. The fungal hyphae may also demonstrate a characteristic MR signal intensity void on both T1- and T2-weighted imaging. Despite this, the imaging of sinonasal schwannoma may still be so nonspecific as to make it indistinguishable from these other entities. One of the main roles of imaging is to map accurately areas of disease extension, particularly into the adjacent orbit and anterior cranial fossa. This role is of vital importance to treating clinicians because it would potentially influence surgical approach as well as guide the mapping of target volumes for radiation therapy. In addition, imaging can be helpful in directing the clinician to an appropriate site for tissue biopsy and can also help alert to the presence of features such as prominent tissue vascularity, which would require even more care and prebiopsy planning. There have been reports of patients with neurofibromatosis (NF) who have developed nerve sheath tumors in the paranasal sinuses and nasal cavity.8 Although extremely rare, this possibility should be kept in mind, and careful clinical history and physical examination should be undertaken to exclude NF in patients with sinonasal schwannomas. The authors could not research an exact figure stating the incidence of sinonasal schwannomas in patients with NF; this problem is likely a function of the very rare nature of this lesion. Thus, only in those cases with a high degree of clinical suspicion such as family history or visible physical stigmata would it seem prudent to consider MR imaging screening of the neuraxis for other lesions of NF. 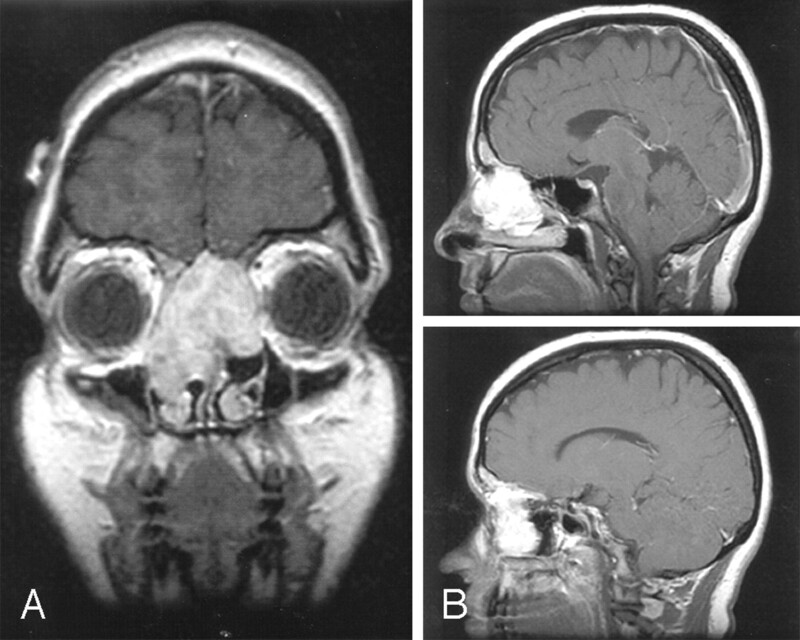 Sinonasal schwannomas have been postulated to arise from Schwann cells associated with the ophthalmic and maxillary branches of the trigeminal nerve as well as autonomic nerves to the septal vessels and mucosa.1 There is some controversy as to whether sinonasal schwannomas can arise from the olfactory nerve components. Sharma et al9 stated that olfactory neurons lack Schwann cells and cannot give rise to such neoplasms. However, there are 2 recent case reports10, 11 that suggest that the olfactory nerve may indeed be the point of origin of these lesions. Murakami et al11 specifically noted that the fila olfactoria is known to acquire a Schwann cell sheath at approximately 0.5 mm beyond the level of the olfactory bulb and can thus give rise to a schwannoma. The treatment of choice of sinonasal schwannoma is surgical excision.12 Prognosis is generally excellent. Sinonasal schwannoma is a rare benign tumor. It can often present with nonspecific symptoms, can attain a large size at presentation, and can invade adjacent critical structures. It should be considered in the differential diagnosis of sinonasal mass lesions. Accepted after revision May 10, 2005.